All transactions are safe and secure with a reliable history in online purchasing behind each of our associates. 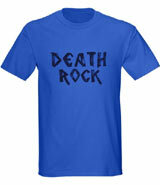 Buy the Beavis Death Rock Costume t-shirt to own Beavis and Butthead clothing and merchandise. Do you wanna rock? This blue Death Rock Beavis t-shirt can be seen in a variety of promotional items for the show, second only to the Beavis Metallica shirt. It is a great option for a Beavis costume and the Skull t-shirt below could be used by a friend as a Butthead costume. Pick yours up today as well as some Beavis and Butthead merchandise to brush up on your character's mannerisms. Use the action figures to help with reenacting the show's scenes. In addition to the Beavis Death Rock Costume tee above, browse the Beavis and Butthead Clothing Gallery for more apparel like men's and women's clothes, kids shirts or hoodies.